That was weird, and I’m not sure how I feel about it. I’ve gotten into this mental thing where if I don’t leave thinking that OMG I AM SO TIRED AND THE WORST EVER AT CROSSFIT, then I feel like I should be working harder. In retrospect, that’s pretty silly. I should be working smarter, not harder. 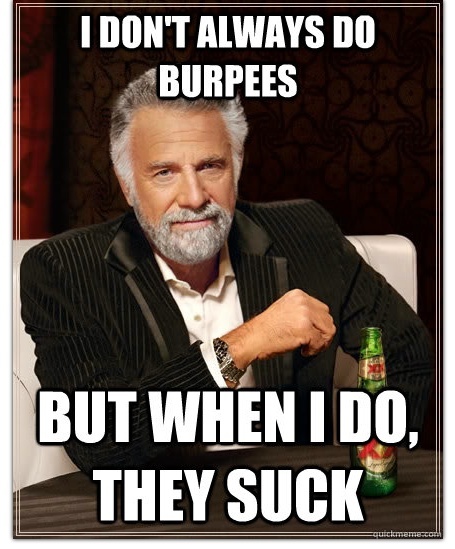 Burpees are still my kryptonite. I did pretty well on the strength based movements (light deadlifts and DB push presses), but damn. DAMN. Is there a way to get better at burpees without just practicing burpees? If I had moved as well on and fast during the burpees as fast as I did the lifts, then I would have nailed the workout. So conditioning work? Just a couple of dozen burpees a day? Damn. Damn. Damn. I hate burpees more than I hate people who don’t answer their email, and that’s saying a lot (which is also hilarious, because you know who’s bad at answering her email? THIS WOMAN RIGHT HERE).